My time out exploring the wonders of my world have been somewhat restricted by a certain growing little person, due for eviction in 6 weeks. Funny though, that even very local expeditions end in the most unexpected amusement. 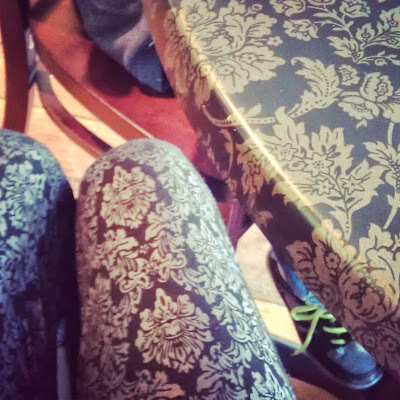 Wearing a $3 pair of leggings I picked up on my last trip to Vinnies Victoria in Ringwood, which matched the table in a local cafe my son and I stopped by for afternoon tea. Oh dear. Have you experienced a time when your outfit matched room furnishing?! If you can 'borrow' the table, wear the leggings and come over to see my curtains, then it will be a trilogy! it's never happened to me! but your leggings are so cool. I've seen many table cloths I'd love to wear as skirts. @List Addict - hilarious, your curtains match too! @Patti - thank you. I too have seen many table cloths that would be great to wear as skirts! Thats brilliant! I've always liked a touch of matchy-matchy, but i haven't had an interior decor fasion moment quite like yours! Glad to hear your still rustling through the oppys in your advanced state of pregnancy, i went of them (old shoe smell mainly) so had quite a dry period!